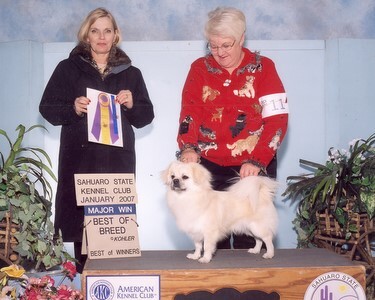 Joey was handled to his AKC Championship by Joyce Standish. 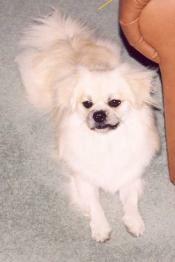 While a class dog, he was awarded multiple Best of Breeds and then as a special he won multiple Best of Breeds. 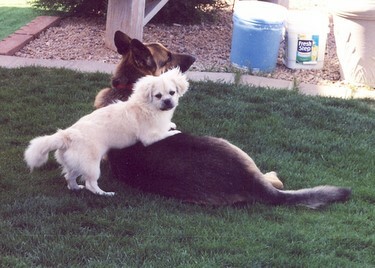 Joey is convinced that he's the top dog at his house. Fritz, the German Shepherd Dog, just lets him go ahead believing it because it makes life easier that way. Joey is a happy, loving boy who just brings a smile to your face when he starts zipping around the yard playing chase with Fritz.